Whoever said blue eye shadow is dated obviously isn’t wearing it the right way!! 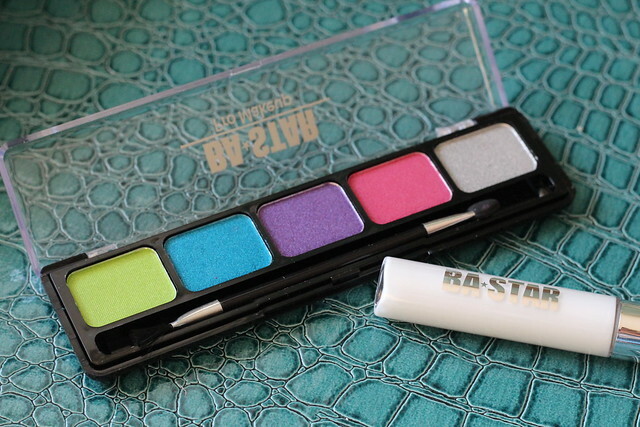 BA STAR sent over this Tropical Eye Shadow Palette & I knew immediately that the first look I was going to create was using the blue shade!! It’s such a fun color to wear in the Summer and pairs so well with a little bit of a tan! The best part is that if you apply it, blend it & swipe on some mascara, it’s a look in and of itself, no liner or other shadows required!! 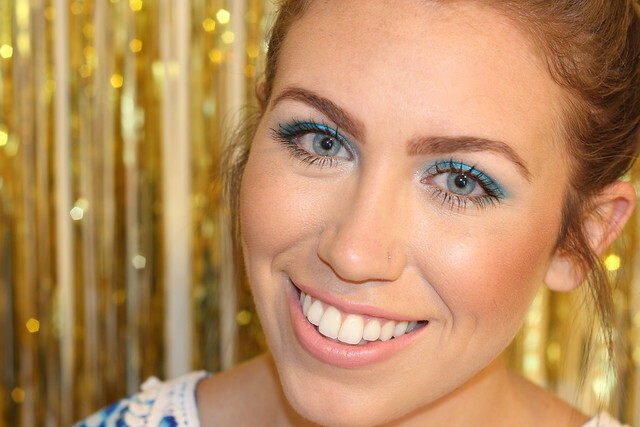 Are you daring enough to try out a bright blue like this?? 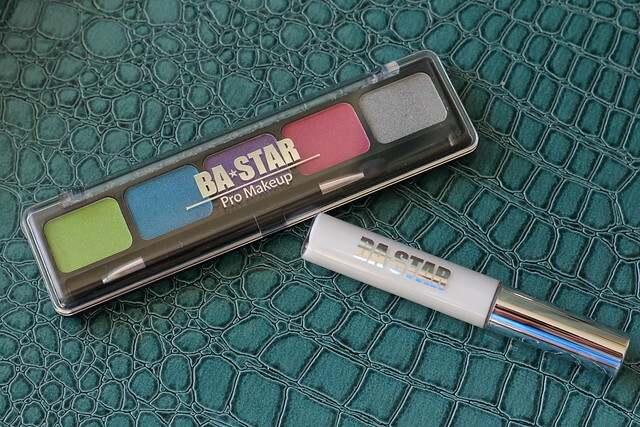 I hope you’re saying yes because BA STAR is giving 2 of my readers a Tropical Eye Shadow Palette & their AMAZING Blue Eye Shadow & Glitter Base (literally the most amazing stuff ever!))! Prime face with Skindinavia Makeup Primer Spray (c/o) to prep skin for foundation. Using a Foundation Brush apply Clinique Redness Reducing Foundation to entire face. Conceal under eye circles with IT Cosmetics Bye Bye Under Eye Concealer (c/o). Apply NYX Matte Bronzer in Light (c/o) to hollows of cheeks and around hair line. Dust mark. Just Blushing Blush in Charmed to apples of cheeks. Highlight cheekbones with mark. Touch & Glow Shimmer Cream Cubes. Prime eyes with BA STAR Glue Eye Shadow & Glitter Base (c/o). 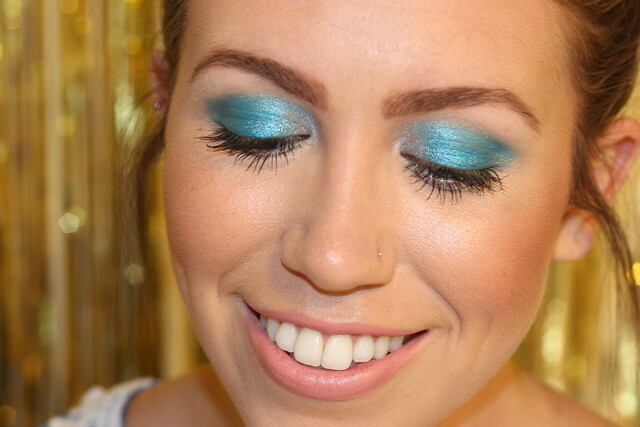 Apply blue shade from BA STAR Tropical Eye Shadow Palette (c/o) to lid, followed by silver shade in inner corners of eyes and along lower lashes & blend. Curl lashes with mark. Make Me Lash Eyelash Curler. Swipe upper & lower lashes with 3 coats of Rimmel London Scandaleyes Retro Glam Mascara (c/o) in black. Groom and fill in brows with Benefit Brow Zings. Highlight under brows with Chella Ivory Lace Highlighter. Finish lips with LoveMarc Lip Gel Rouge in Role Play (c/o). Giveaway runs from 6/23 – 6/29 at 11:59pm EST. Winners will be announced on the blog & notified via email! Don’t forget to get your FREE U by Kotex Samples!